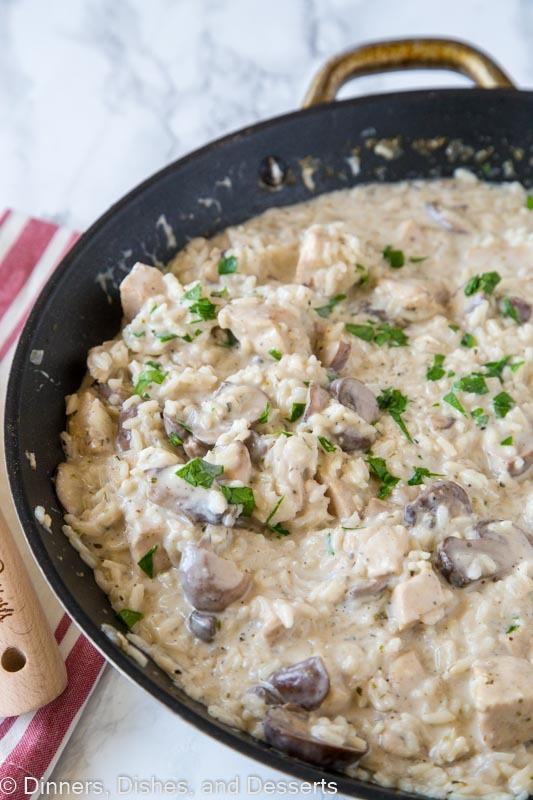 Stovetop Creamy Chicken and Rice – Tender chicken and mushroom with creamy rice in an easy one pan dinner. So easy and great for busy nights. When I was growing up there were a few things that were staples in our house. Chicken and rice casserole was one of them. My mom would mix a can of cream of mushroom soup, milk, rice, and lots of poultry seasoning together. Top with chicken breasts and bake until everything was done. I loved the creamy mushroom rice in that dinner. But today I am making it even better! 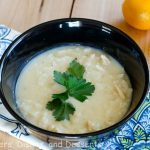 Not only is there no canned soup involved, but it is ready in about 25 minutes on the stovetop, and all in just one pan! Plus real mushrooms are involved! There is still the milk to make it creamy and delicious. This post is sponsored by ADA Mideast. All thoughts and opinions are 100% my own. 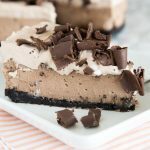 I am excited to be sharing this recipe in a partnership with the American Dairy Association. You may remember Yogurt Marinated Pork Kebobs that I shared earlier this year. I am a huge proponent of using real milk and dairy in your life. Dairy alternatives tout a nutrient or two, but they don’t measure up to the nine essential nutrients in cow’s milk. Many milk alternatives are fortified to mimic the nutrient profile available in cow’s milk. For example, an 8-ounce glass of cow’s milk, including fat-free, flavored and organic, provides eight times more naturally-occurring protein than a glass of almond beverage. Non-dairy alternatives, such as almond and soy, contain many added ingredients, including salt, syrups, thickeners and sugars. Cow’s milk, on the other hand, is pure and simple. Check the label to compare the added ingredients. 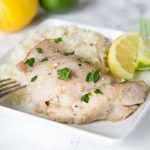 This chicken and rice has just a few simple ingredients, and that is what makes it over the top amazing! 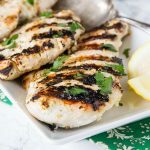 Chicken dinner ideas are something that everyone is always looking for. 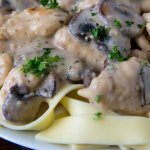 It can be something like Tuscan Chicken Pasta that is creamy and delicious. 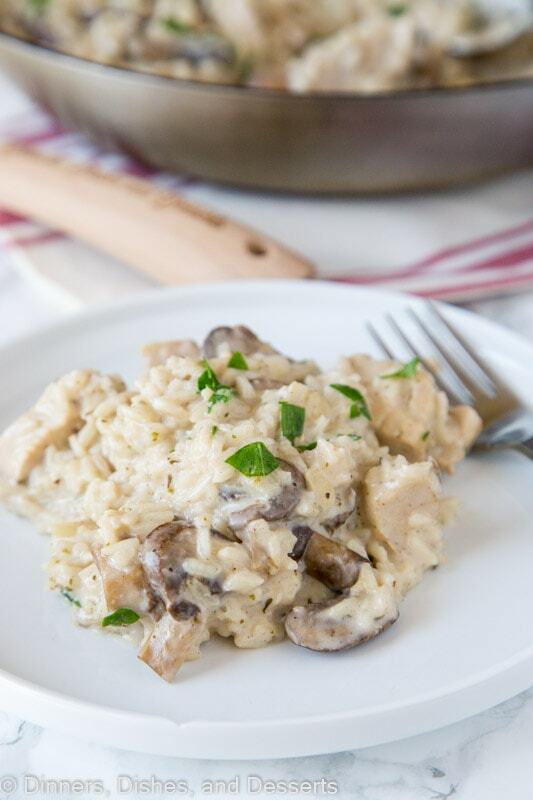 Or a classic chicken and rice casserole. 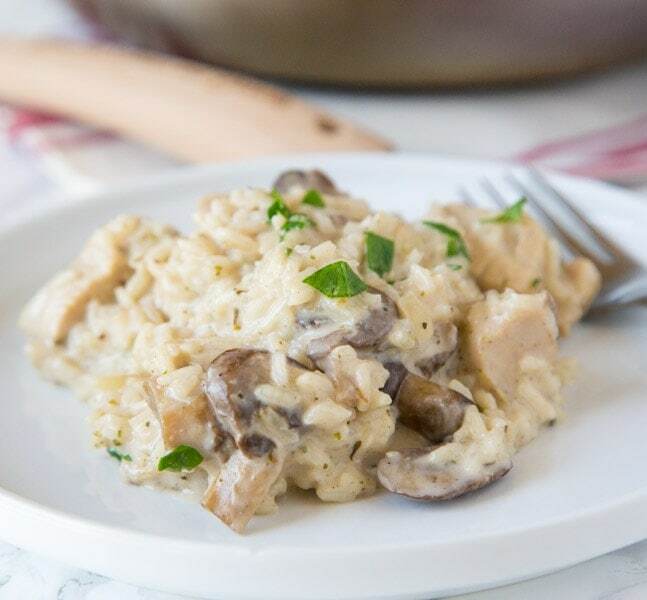 Mushroom rice pilaf is one of my favorite side dishes, so why not combine a classic with my favorite side dish for a delicious and tasty chicken dinner. 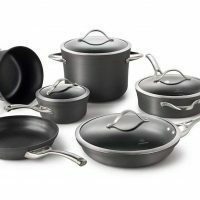 Anytime you can cook a full meal in one pan I am happy! 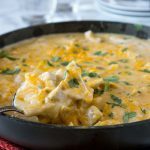 And this creamy chicken and rice is a huge crowd pleaser. 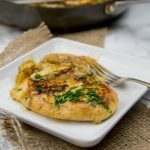 The poultry seasoning is what I used to love about the chicken and rice casserole my mom made. So there is plenty of it here! The rice and everything cooks together until the rice is tender. Then you stir in milk or even heavy cream right and the end to serve. Seriously, the whole family is going to love this! See how cow’s milk stacks up against other “milk” options in the dairy aisle. 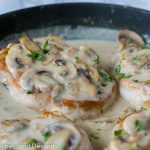 Not only does it make this easy chicken dinner extra creamy and delicious, it is nutritious and good for you. For more information about dairy nutrition, to find delicious new recipes and to meet Ohio and West Virginia dairy farmers, visit Drink-MIlk.com, and follow the American Dairy Association Mideast on Facebook, Twitter, Pinterest and Instagram. 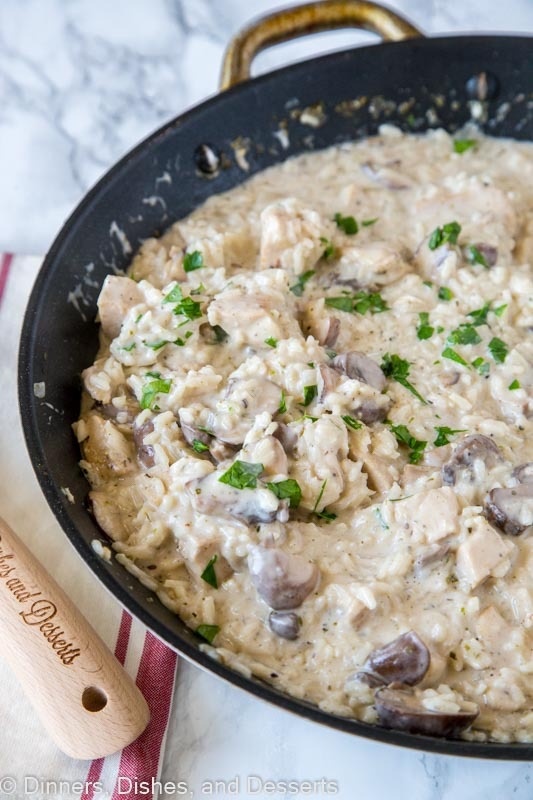 Stovetop Creamy Chicken and Rice - Tender chicken and mushroom with creamy rice in an easy one pan dinner. So easy and great for busy nights. **This post is sponsored by ADA Mideast. All thoughts and opinions are 100% my own. No canned soup and it is comes together in a snap? You are calling my name!! This dinner is calling my name! 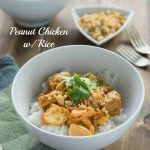 Love chicken and rice for dinner! This is a great idea for dinner. I love it! I am going to try this out. mmm I adore the chicken! I want to eat it every day! I am going to make this! 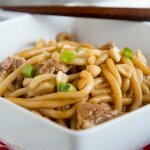 This recipe really impresses! I really like! 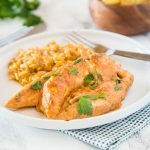 I love how creamy this chicken and rice looks! My type of dinner! What an interesting combination of ingredients. I really like. This looks really good! So yummy! My family would LOVE this! It looks fantastic!! 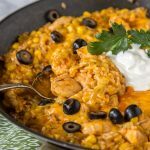 Chicken and rice is always a hit in our house! This is so creamy and delicious! This is my kinda comfort food! So delicious! My family loves these flavors! 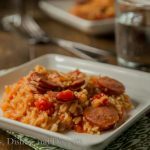 Perfect weeknight meal! So creamy and delicious! 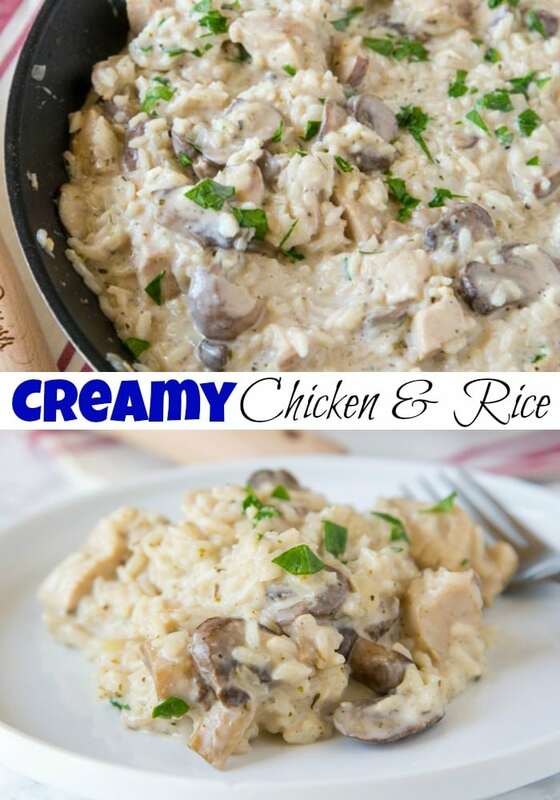 I bet my family would absolutely LOVE this creamy chicken and rice. Yum! I live in the UK so we use mls or fluid ounces for liquids can anyone tell me what a cup of milk or stock would be please. This is very good but my husband thinks it may have a little too much seasoning. I may try it next time with just a teaspoon each of the spices. 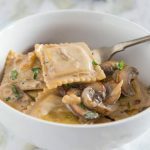 I tried this recipe last night. 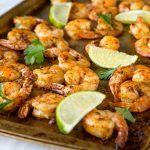 Great flavor and so easy to make! Only one problem: I am cursed with the inability to cook rice. I followed the directions exactly, but the rice was still hard, even after cooking an additional 10 minutes. I’ve never been able to cook rice, so I kind of expected it. But it still tastes good, even if I have to chew on the rice. Did you cover it while the rice was cooking? Rice needs steam to cook, so it has to stay covered, unless you are stirring it, to trap in the moisture and let it absorb all of it. What kind of rice are you using?